Headed due east into the sunrise. It all comes down to this: “The Crossing”. 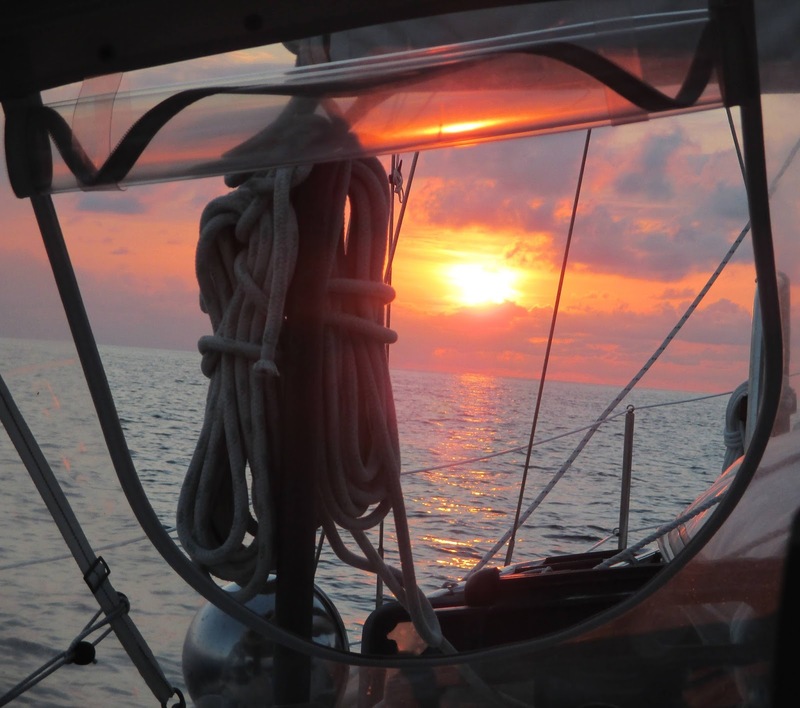 Much has been written in the various guide books, but “How you handle the crossing will determine whether this is a good trip or a bad one.” Skipper Bob, “Bahamas Bound”. There are several places along the south Florida coast from which to cross to the Bahamas. Many cruisers choose Fort Pierce or Palm Beach, as these provide the first opportunity for south bound cruisers to cross. We decided to cross farther south and here’s why. The ‘problem’ is the Gulf Stream, particularly for a slow vessel such as a sailboat like Layla. The Gulf Stream will push your boat to the north, and you must steer to the southeast to compensate. How much you compensate depends on the width and speed of the Stream. This all sounds quite simple to calculate, but the Gulf Stream can be wider or narrower than its average width of 25 miles, and faster or slower than its average speed of 3 knots, depending on where you are relative to it. Most honest boaters, no matter how seasoned they are, respect the Stream and will admit to some anxieties about a crossing. Weather also plays a role in the crossing conditions of the Stream. Since the Stream is traveling north, any wind from the north, thereby opposing the north flow, will cause large short waves. 15 knot winds can cause 10 foot waves in the Gulf Stream! Have you seen a ten foot wave in a small boat? Therefore, boaters avoid a crossing when winds are from any combination of wind from the north. 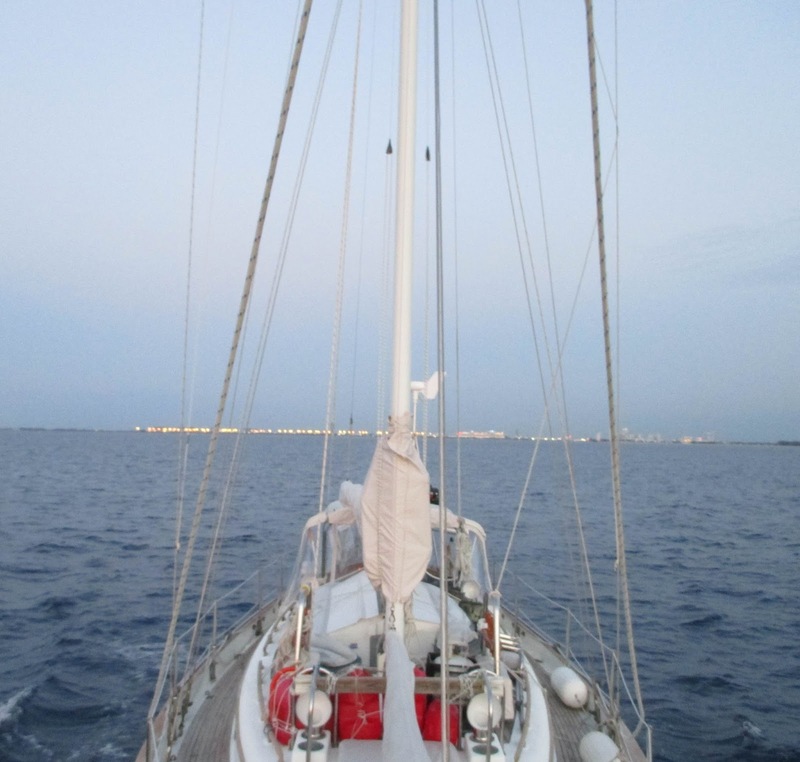 Heading East to the Bahamas, a southwest to west wind direction is ideal for a sailboat, and less than 20 knots makes it a more comfortable ride. 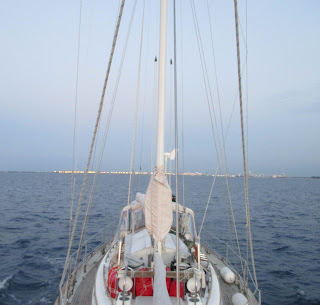 And so we decided to head out from Fort Lauderdale and head to West End on the Grand Bahamas Island, with a rhumb line course of 64 degrees magnetic. This is a slightly longer crossing than Palm Beach, but has more of a northerly course, and we could take advantage of the Stream rather than fighting it. There are several ways to plot the course to account for the Gulf Stream. We opted to use a method where we followed a fixed compass heading rather than having the GPS recalculate our course as we veered north. At a boat speed of 5 knots, with 69 miles to West End, we steered a course of about 90 degrees magnetic, due east. This compass heading results in an “S” shaped course as you are pushed north. 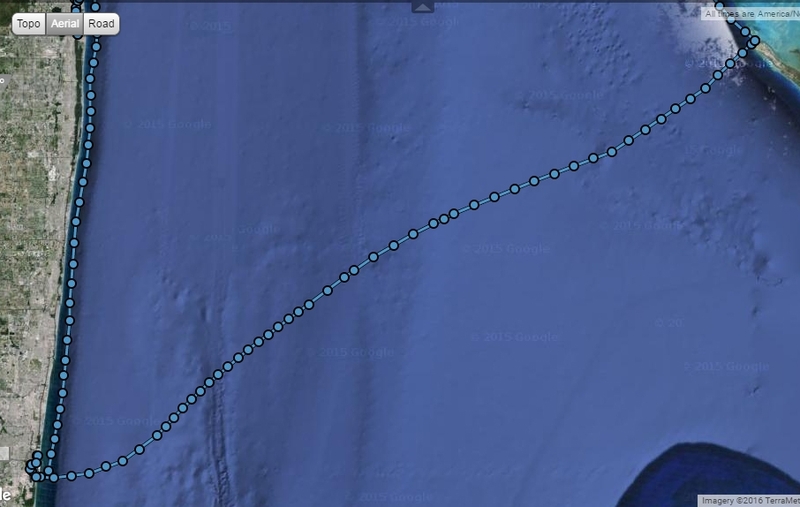 “S” curve of our course taken from Fort Lauderdale to West End, Grand Bahamas Island. We had planned, provisioned, re-planned, re-provisioned, and repeated this scenario several more times. We were ready to go. Chris Parker, the noted weather guide for boaters on the single side band radio, forecasted southeast winds at 5-10 knots, not perfect, but manageable. Our crossing began at 4 am. We simply could not sleep anymore. We pulled anchor and called to request an opening of the first bridge (Las Olas Bridge) at 4:45 am. We then meandered through the canals to the next bridge near the harbor inlet. Tracy steered in the dark passing between the markers – green on the left (port), red on the right – Bud showed a spot light to help illuminate the markers. As we waited for the bridge to open at 5:30 am, the current pushed us nearer and nearer to a marker. And on the other side of the bridge, nearly the entire view ahead was filled with a ship. A huge cruise ship was just arriving, like a high rise condo but on the water. By the time the bridge opened and we passed through, the cruise ship was at the dock and no longer posed a threat. We turned out the inlet as the first of dawn began to brighten the morning. Ahead we could see more lights of another cruise ship coming through the channel. Soon a pilot boat came along side of us attempting to hail us on the radio but his radio wasn’t working. Now close enough to hear him shout, he said we must move now out of the way of the cruise ship – “There is no room for both of you in the channel and the ship, she is coming fast. Move south now!” And move we did. The cruise ship up close is huge with maybe 15 decks towering above the water – a massive thing on the water. The day now began with the calm. No winds. We had to motor. 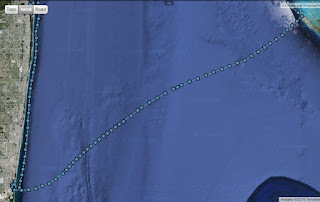 We set the autopilot to the compass course, steering 90 degrees due East. As the sun rose, winds filled in from the northeast at 5-10 knots. Yes, we crossed with winds having a northerly component. But the seas were calm, maybe 2-3 feet. It would be a good crossing. About 5-10 miles out, we realized that the GPS and compass were differing by 30 degrees! This was wacky. Which one do we believe? We reread the guide books on the crossing and realized that this wacky GPS was normal. The GPS was showing course direction, while the compass showed our heading. The Stream was pushing us sideways. We were “crabbing” to the Bahamas. We could see from the track through the day that we were making the distinctive “S” shaped curve. Looking back (west) at Fort Lauderdale and Miami. We lost sight of land and could no longer see the high rises of Fort Lauderdale and Miami further south. We passed into the indescribable cobalt blue of the Gulf Stream – flying fish scattering ahead and to the side. The winds shifted to the east. 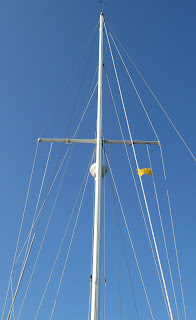 We put the Genoa up (the most forward sail on the bow) and increased our speed about a knot. We were going 5-6 knots and sustained that much of the day. Several hours later we began to see land on the horizon – not much elevation but a water tower of West End. We had made it! We anchored around 7 pm only to find when we dove on the anchor, the entire ‘anchorage’ was hard coral covered with a dusting of sand. We put out more chain and put on the anchor drag alarm. 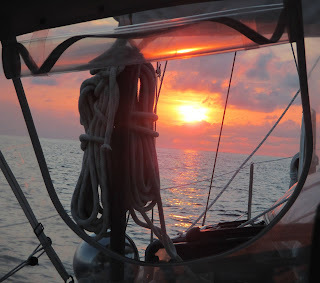 We were fortunate that the winds were light and the seas calm, and stayed put all night. A good end to a great day. 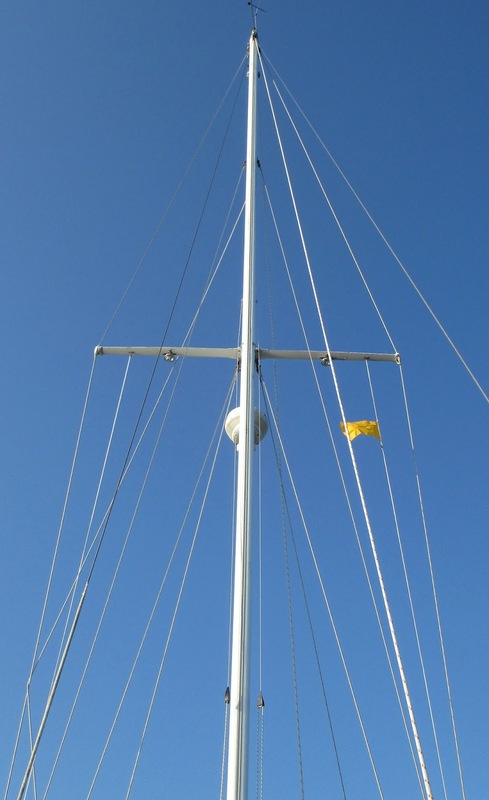 “Q” flag (quarantine) hoisted after anchoring outside West End. Next: Arrival in the Bahamas. Remember, you can click on the map in the upper right hand side of the blog and see where we are anytime. A 'Q' flag is a quarantine flag to identify you as not had mg been cleared to enter the country. Remember in the 'old days' you had ships that required to hold offshore before anyone could enter because of disease. Thus the legacy of quarenine. Neat explanations of how the crossing involves some pretty high-powered navigation. I never gave it much thought about sailing vessels although I was well aware of the Gulf Stream. I'm going to have to think about that difference between the GPS and the compass. It makes sense, but I need to see it on a map, or a diagram. Questions - is the current effect less on each 'side' of the stream? If it is less on the sides does that require compensation or as long as the heading is correct the course is correct? I'm no sailor. We stood on the shoulders of experienced sailors. We have a table that gave us a corrected course to steer based on the expected speed of the boat and an average speed of the Gulf Stream. The course to West End was 64 degrees and we added degrees to be 90 degrees to steer. Since we "crabbed" or moved sideways due to the push North by the stream, the GPS recorded that, while the compass simply told us the actual direction we headed. So the vagaries Gulf Stream really were not that important. The "s" curve reflected that actual course within the Gulf Stream. It was more severe at the beginning than at the end of the trip.